Much as I hate to have to wait until September to see the new season, I will be content as long as Drums of Autumn doesn’t take an entire you to film. Please say they’re going to start production on DOA before September. No, they’re not. They’re still filming Season _Three_. And the actors and crew do in fact need at least a little time off before they throw themselves back into the grinder. [g] Season Four will start filming in the fall. If you see Diana’s webpages as black text on a dark teal background, this is a known problem for a small percentage of devices and web browsers. Her webpage text should always be readable on an ivory-colored background. Send me an email if you have this problem. Thanks. While I regret the delay, I’m confident that the writers, producers, actors and crew will deliver an excellent season. Well worth the wait! Can’t wait for the new series. I enjoy the books so very much and am trying to get my daughter to read them. I will start her off with the first and from then on Diana’s storytelling will take over. My books are practically worn out from re-reading them. Waiting patiently(maybe) for No. 9. I enjoy reading your books so much and like a lot of people I can’t wait for the next one to come out but my answer to that problem is to reread the book from last to first. I tired rereading from the first book but I think looking at the show kind of put that off for me I kept feeling like I had to start at the story line of the show. Well, its been interesting to read them in that order, sort of like looking at your family history. With all the projects you do I don’t know how you keep up with your writing at all but I’m glad you do. Good luck, looking forward to the next book. Interesting title. My favorite chapter of this magnificent, massively epic series. I’ll wait, if I must, but it won’t be easy!! I must say, I did have my doubts about bringing Diana’s opus to the screen, but Ron & Company have absolutely done it … and done it like no other beloved book(s) prior. Thank you, Diana, and your very special brain, for creating this amazing series … and for the resultant TV show. My life would have been considerably lessened without them. Like so many others, I fell in love with Outlander when it first came out and have read all your books. The stories are so real to me that I view them as true history and Jamie and Claire as real people. I adore the TV series as well and am excited that it will continue. Hands down, you are my favorite author. Thank you for years of reading, and daydreaming, pleasure. I am torn between despair that we have to wait until September and elation that they are so committed to making this season the best it can be! What am I to do in the meantime though…guess I’ll have to re-read the entire series! Oh darn! My late husband and I read all of this wonderful series that was published before he died in 2006 several times each while awaiting the next in the series. We loved each and every one! I’ve bought and loved everyone published since that time and I’m still anxiously awaiting the next one! I’m reading them for both of us now. I know he would have enjoyed the TV series as much as I have and would be looking forward to each season. Thank you so much for all your hard work! I can’t wait to see this! I hope all 8 books are brought to TV and book 9 when it’s done!! Finished reading Voyager,Very emotional about it.Since it was the twist and turns of events.Very different from all the books I read since my grade school days to college days.Threes decades ago(that would tell you how old I am now? ).Diana,how in the world did you get the inspiration to write this series of books?If and when I will be fortunate to see you face to face,I would like to ask you two questions that had been in my mind after reading your books,I hope to see you in one of those Comic con events which I found very difficult to navigate being not computer savy and tech savy to get those comic con tickets for years now.Thanks.Salamat po! I’m 57 years old and have been an avid “Outlander” fan since 1992, waiting months for the next book and the next book and the next book to come out! If the television production team is ever looking for cheap, responsible labor … I’m your gal. I will walk the horses, scrub with the kitchen wenches, polish the standing stones and bring Ms. Gabaldon her tea every morning. I would just like to be on-set for one season during my lifetime. And no, I’m not a loon. You can look me up on Google. My presence notwithstanding, the operation of a TV production just doesn’t allow for free-lance or walk-on labor. Everyone there has a specific job, with a job description, and has applied, auditioned, or been recruited to perform their specific functions. If you wanted, say, to be an extra, that might be possible, but you’d have to contact the casting department and ask when they’re holding a “call” for extras, and then go and apply in person. You might consider the notion of working on set carefully, though–it’s 5-6 days a week of very hard work, for 10-14 hours a day, for a pretty solid nine months. Being an extra would normally take only a few days, though. 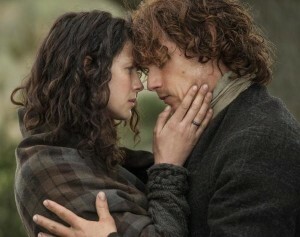 I am waiting for season 3 series on Starz. Having read some information about its content, I am confused. Why is Season 3 starting with Brianna as a baby? Is it a refresher? I love the way Diana writes, she is the best author. She keeps me on the edge and fulfills everything I desire in a book. Glad you’re enjoying the show! Like the books [smile], the show employs flash-backs and non-linear storytelling. And, like VOYAGER, Jamie’s story (from the time they part at the stones) is told going forward, while Claire’s is told backward, recounting what her life was like during their years of separation. Don’t worry, it’s not at all confusing and will make perfect sense when you see it! Voyager is my favorite of all of the 8 books. I just finished reading it for the third time and could clearly visualize so many scenes translated onto the screen. The story is full of adventure, tension and romance. Of course, I am looking forward to seeing Jamie and Claire’s print shop reunion but also the sea voyage scenes. It will be epic. I know the cast and crew are putting their hearts and souls into making this another fabulous season in the ongoing saga of Jamie and Claire. Thank you Diana for writing these great books. P.S. Sam Heughan and Caitriona Balfe are superb. Can’t see anyone but these two playing the roles of J & C.
Well…of course it will be. Have you ever seen a TV show that _didn’t_ come out on DVD? Hope you enjoy it! OH MY WORD!!! I would have loved to meet both Caitriona and Sam while they visit one of our most beautiful Cities. Not to even mention my mom of 75 (she LOVES SAM!) I hope that Diana will too …. Have a great time you guys, there is only ONE CAPE TOWN in this World of ours! Warm greetings from a BIG FAN since 1998 when I bought my first copy in Atlanta. I have since read the books 3 times over from front to back. Glad you enjoy them both! As for the series, it’s approved through Season Four (and the production people are already breaking script and scouting locations for S4, even as we speak). Really disappointed that the series will not begin again until September. My husband and I are traveling to Scotland IN September. I was really hoping that he would have “experienced” Cullonden via Outlander before we go. It may happen while we are there!! Is the series beginning any earlier in Scotland?? Love the first 2 series and so excited to watch Voyger. Love the premis and since I am British find it fascinating. I had a love and so romantic marriage. For 50 years. Can’t wait to see what happens. Think I will buy the book. I’m so sorry to hear about your husband. [hug] I hope the books might be some distraction and escape for you.